Glaucoma is a name given to a group of diseases that are potentially blinding and have a characteristic pattern of serious damage to the optic nerve and visual field loss. An estimated 3 million Americans have glaucoma and it is the most common cause of irreversible blindness in African-Americans. The front of the eye is nourished in part by fluid that circulates through it called the aqueous humor. This fluid is constantly being produced and evacuated from the eye. When the rate of production equals the amount evacuated, a stable pressure without wide fluctuations is achieved. The main area through which the fluid is evacuated is known as the trabecular meshwork. In open angle glaucoma, the trabecular meshwork appears normal upon examination, but there is an increased resistance to fluid outflow that is microscopic; this resistance leads to an increase in pressure. In angle closure glaucoma, the trabecular meshwork may become blocked by the iris, abnormal blood vessels or scar tissue, which can also cause an increase in eye pressure. Higher intraocular pressures lead to a higher risk of glaucoma. Intraocular pressures are a complicated risk factor in the development of glaucoma. Higher pressures lead to a higher likelihood of developing glaucoma at a faster rate however, some patients with elevated pressures will not develop glaucoma. Furthermore, some patients with normal pressures will develop glaucoma. Patients suffering from early open angle glaucoma, usually have no symptoms but as the disease worsens, increased loss of peripheral vision becomes apparent. In the late stages of the disease, a person may experience a marked reduction in peripheral vision. In most cases, the central vision remains strong but this too will deteriorate over time. Regular eye exams are encouraged so patients can be screened for glaucoma for early diagnosis. Patients with angle closure glaucoma tend to have more recognizable symptoms such as nausea or periods of pain, ranging from minimal discomfort to an extreme aching pain in the eye and head. With each episode of pain, the vision may become very blurry or colored halos may be seen around lights at night. For this reason, patients with closed angle glaucoma often seek medical help sooner and are diagnosed with the disease before those with open angle glaucoma. Sometimes, if the angle closes slowly, symptoms can be very mild and can go undetected by the patient. To determine if you have glaucoma, your ophthalmologist will perform a series of tests during your initial examination of your eye. At Eye Physicians of Long Beach, our doctors will perform a thorough evaluation in including measuring your visual acuity, checking your refraction, or best vision with glasses, and measuring your eye pressure. The thickness of your corneas may also be checked, as thinner corneas are a risk factor for glaucoma and variations in corneal thickness can lead to false reading of pressures. Thinner central corneal thickness (CCT) may lead to an underestimation of pressure, while thicker CCT may lead to an overestimation of pressures. A dilated exam will be performed to test your pupils, which helps the doctor determine if one optic nerve works better versus the other. Our doctors will use a microscope to examine the eye, the lens, the optic nerve, and other important structures of the eye. The trabecular drainage system of your eye will also be examined with a special contact lens called a gonioscopy lens. In addition, you may also have an automated visual field examination which is a computerized examination of your peripheral vision. As glaucoma develops into the moderate or advanced stages of the disease, optic nerve fibers are destroyed, causing the optic nerve to appear hollowed out. Your doctor will also be able to see the loss of small sections of retinal nerves around the optic nerve, or small areas of bleeding on the optic nerve. Additionally, if angle closure is present, your doctor will be able to see iris or scar tissue physically blocking the trabecular drain. An examination of your retina may also be performed during the dilated examination. Photographs of your optic nerves may be taken in order to view the appearance of your optic nerves. Computerized optic nerve imaging may also be done at Eye Physicians of Long Beach, we have both an HRT (Heidelberg Retina Tomography) and an OCT (Ocular Coherence Tomography). 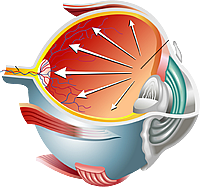 The HRT can give detailed information about the 3-dimensional structure of the optic nerve cup by using a laser to create 3-D photographs of the optic nerve and the surrounding retina. The laser is able to take pictures of 32 layers of the optic nerve by simply changing the focus of the laser each time so that it can image/photograph deeper areas of the nerve and creates a three-dimensional image of the optic nerve. The optic nerve when seen as it enters the eye looks like a doughnut. The HRT is useful in calculating things like the size of the optic nerves, the area of the rim, and the volume of the cup (the hole in the doughnut). These measurements are useful in differentiating an optic nerve that has glaucoma from a normal nerve or follow the optic nerve for changes. The Ocular Coherence Tomography (OCT) instrument utilizes a technique called optical coherence tomography which creates images by use of special beams of light in a similar fashion to the HRT. The OCT machine can create a contour map of the optic nerve, optic cup and measure the retinal nerve fiber thickness before it enters the optic nerve. The OCT is a better tool for monitoring and detecting early glaucoma and the HRT for moderate changes. The best way to avoid losing vision from glaucoma is to have regular eye examinations with your eye doctor. Early detection of glaucoma is important so that it can be treated, which may be able to slow or halt the progression of the disease. Once the vision is lost, it cannot be restored. Having a regular eye exam can help prevent the possibility of glaucoma and other diseases from harming your vision. 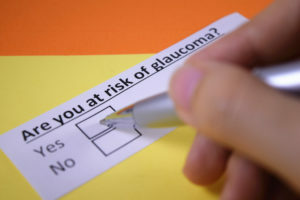 The main risks factors for glaucoma include, advanced age, decreased corneal thickness, racial background, decreased corneal thickness, and a positive family history of glaucoma. People of Asian descent and Caucasians have a higher risk of closed angle glaucoma. Asians represent a large portion of those diagnosed with this type of glaucoma. African-American patients have 3-8 times the risk of developing glaucoma and 15 times the risk of going blind from this disease when compared to the rest of the population. If you have a family history of glaucoma or any other eye diseases it is vital that you seek the attention of an ophthalmologist. Patients who have a parent with glaucoma have a 5-15% risk of developing glaucoma; this is 2.5 to 15 times the general risk, and siblings of patients with glaucoma have a 10% risk of developing the disease. If you have never been examined and think you may have glaucoma or have a family history of the disease and would like to schedule an appointment, please call our office at 562.421.2757.